Made Here is a walkable urban art experience that temporarily fills empty storefronts and commercial spaces with the work of Minnesota artists. 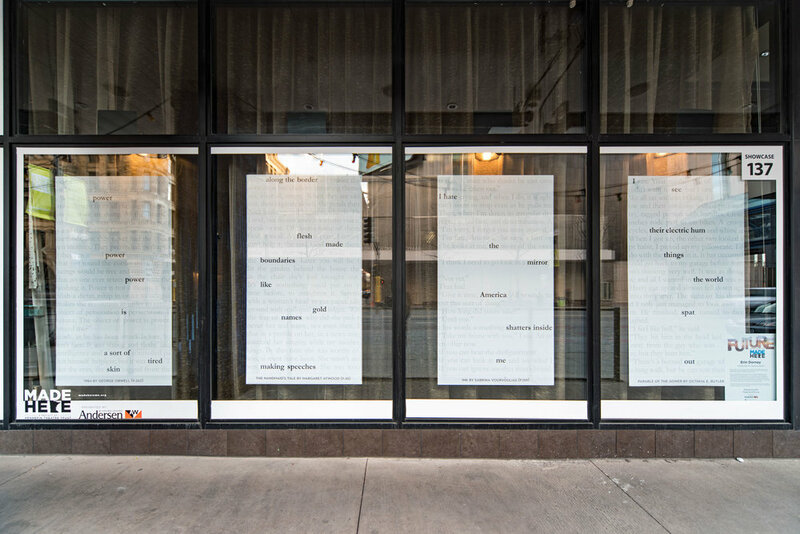 Located in the West Downtown Minneapolis Cultural District, the project aims to highlight artists but also bring attention to available downtown properties—piquing the interest of renters and entrepreneurs. "Dystopia Erased" showcased four erasure poems sourced from different dystopian novels, with themes including the existence of fact through memory; women’s bodies as political instruments; language as a tool of power; the causes of complacency; environmental and economic crises; racial and ethnic tensions; immigration; institutionalized population control; and perceptions of otherness. Source texts: The Handmaid's Tale by Margaret Atwood; Parable of the Sower by Octavia Butler; 1984 by George Orwell; and Ink by Sabrina Vourvoulias.